Who’s Making Top Ranked Apps? Our last post focused on the prices of top-grossing apps. 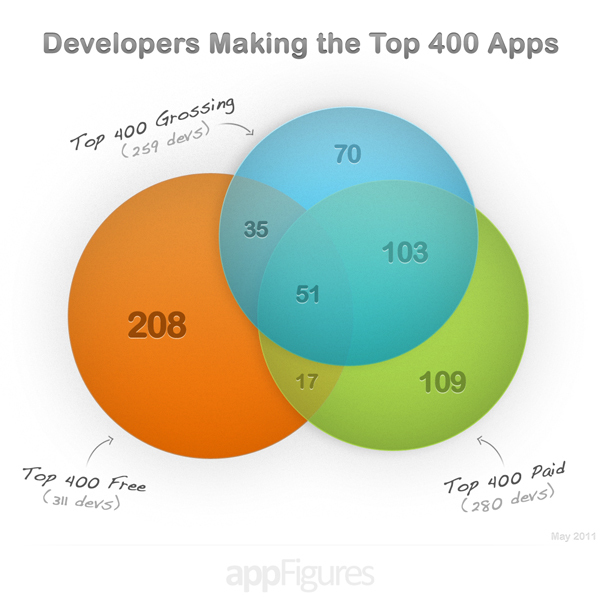 This time around we’ve decided to look at the developers behind the top 400 apps. We’ll be looking at public ranks data for the top 400 paid, free, and grossing iPhone/iPod apps in the U.S. during May 2011. To visualize this, we’ve created a Venn diagram so you can see exactly how many developers there are in each category and in the overlap between categories. It’s probably a good time to point out that when we say “developers” or “devs,” we include publishers. 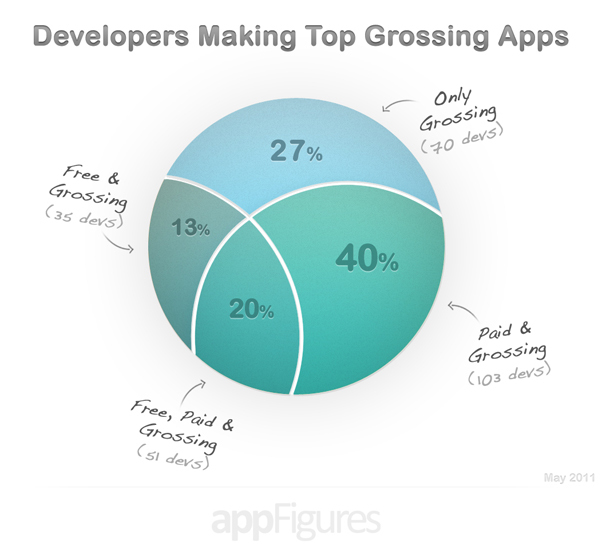 On Average, 22% of the top grossing devs make more than one top-grossing app. Most of these developers have 2-5 top grossing apps. A select few have more than 10 top grossing apps at any time, but there are a couple of consistent rockstars: Electronic Arts averaged 25 top-grossing apps at any given time in May, and GameLoft averaged 12. When it comes to the big guns, this data confirms our expectations. Among the devs in each category there is some overlap—some devs have made one app that’s ranked in the free or paid category and is also a top grossing app. Other devs are in the overlap because they’ve made multiple apps, each app ranked in a unique category. 40% of the devs with top-grossing apps have also created top paid apps; 13% have created top free, and 20% of them have placed in all three categories. Looking only at the devs making free top grossing apps, if we add 13% to 20% to get the full percentage of devs making free apps, we get 33%. Doing the same thing for devs making paid top grossing apps, 40% plus 20% gives us 60%. Since 20% of these devs made free and paid apps, that leaves a whopping 27% of devs who made top grossing apps that are not ranked in the top 400 free or paid categories. Of course, we’re left wondering: who are these 27% of devs with apps that manage to make a lot of revenue without ever hitting the top free or paid charts? What kind of app pulls in enough revenue to make it into the top grossing category, but isn’t popular enough to make into free and paid categories? We’ll be covering this very issue in one of our upcoming posts. To keep up with the latest info follow us @appfigures or subscribe to our RSS feed.